Galway Metals has an Option Agreement to acquire a 100% undivided interest in the Clarence Stream gold project, which is located 70 kilometres (km) south-southwest of Fredericton in south-western New Brunswick, Canada. Galway’s land position comprises 60,465 hectares (149,412 acres) with 65 km of strike length (and a width of up to 28 km) along the Sawyer Brook Fault System, which straddles several intrusives that are believed to have created the conditions necessary for gold deposition. The Company released an updated NI 43-101 resource estimate prepared by SRK Consulting (U.S.) in September of 2017, which included for the first time, a pit constrained resource. All prior resource estimates were based on underground mining only but there are wide, high-grade and near-surface intersects in both the South and North Zones that indicated the potential for pit development. Tonnage estimates for the resource statement were informed by 139 new density determinations collected in 2017 by Galway technicians advised by SRK. Average density values were assigned to the block model by material type, with break-outs for major lithology units, overburden and mineralized zones. Mineral Resources were classified based on NI 43-101 guidelines using distance to source data and geologic continuity. In general, Measured Resources required a minimum of four drill holes within 18m of a block. Indicated Resources required a minimum of two drill holes within 40m of a block. Inferred Resources required at least one drill hole within 80m of a block. All Mineral Resources are reported less than 80m from source data. Management believes that this resource can be significantly expanded and is optimistic about the potential for satellite discoveries. Both the North and South Zones are open along strike in both directions, and the South Zone is open to depth. Resources at Clarence Stream are contained within 2.5-km of Galway’s 65-km strike length. There are many additional strong targets identified along the 65-km trend, including many that exhibit coincident highly anomalous glacial tills, soils, boulders and chip samples, along magnetic lows. Galway’s management believes the confluence of these anomalies is significant, and they have never been drilled. Galway plans on drilling several of these in late 2017-2018. Initial metallurgical test results for gold and antimony estimated recoveries using gravity, flotation and conventional carbon-in-leach (CIL) milling at more than 90% for both the South and North Zones. 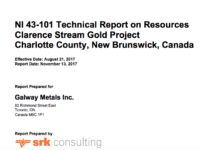 As with the need for more exploration to gain insight into the ultimate size of the Clarence Stream resource, Galway believes more metallurgical testing is also required. Galway’s property is adjacent to the Mount Pleasant tin-tungsten-molybdenum mine and mill, which closed in 1985. Although the gravity concentrators, flotation cells and the ball mill has been sold, mill infrastructure remains intact, and the property has a fully permitted tailings facility, power line and buildings. Strategically, Galway has reached an agreement to lease space within the mill buildings, as well as outside, for core, chip sample, pulp and reject storage, and for core splitting and logging purposes, among other requirements. New Brunswick is well known as a mining-friendly jurisdiction, having ranked first worldwide for Mining Policy Perception by the Fraser Institute in 2011/12, and has ranked in the Top-10 each year since. The Clarence Stream property is accessible via airports at Fredericton and Saint John, via Provincial Highway 770 that bisects the property and rail. Also bisecting the property is a major power line, which services Clarence Stream and the neighbouring Mount Pleasant Mine and Mill as well. Employees, services and supplies will be sourced from nearby towns of St. Stephen, St. Andrews and St. George and a major seaport is located at Saint John 110 km to the east. Staking: Galway staked 1,958 claims to the east and west along the prospective Sawyer Brook Fault System and associated intrusives for CDN$117,480. This added approximately 30 km of prospective ground for future exploration (included in the 65 km total).